Anamorphine is a short gaming experience that will challenge your sense of direction, both literally and metaphorically. The story tackles heavy issues such as trauma, depression and loss of self, all through environmental storytelling. This title is for those gamers, like myself, who appreciate an immersive and emotionally-driven storytelling experience. Anamorphine shows a slice from Tyler and Elena’s life, a young couple who moves into a typical Montreal apartment together. He’s a photographer, she’s a cellist. They settle in, and through Tyler’s eyes, you get a sense of their life together. Then comes the accident. Then the spiraling. The slow descent into depression as guilt, regret and mourning eat away at Tyler’s soul. You alternate between walking through dreamscapes and memories, the two merging together as the game progresses. Through these scenes, you remember your life with her, the lead-up to the tragic events and, finally, you get to make a decision: move on or keep spiraling. 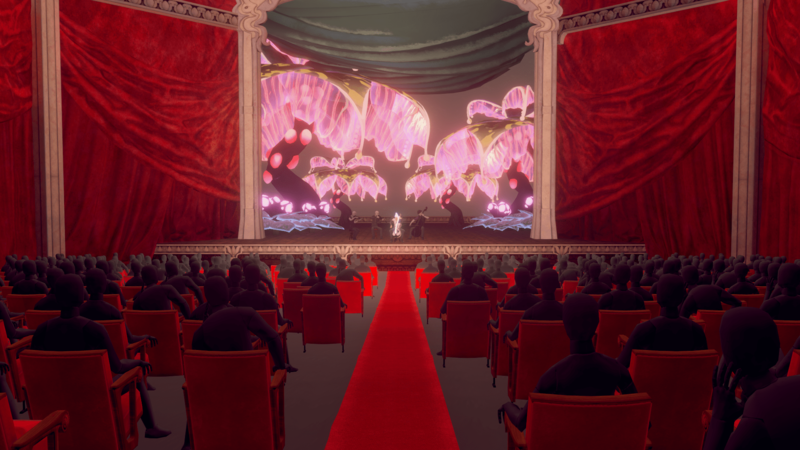 Anamorphine makes great use of environmental storytelling by challenging our sense of space. The game sets a scene in your apartment. You walk through it, taking it in. You turn the corner to head into the bathroom but no, you’re in your bedroom. You try walking the same path but a slightly different scene is set before you. You walk round and round, reliving events until you cross over into a psychedelic dreamscape as you start to lose grip on reality. This gut-wrenching experience is accompanied by a haunting soundtrack and finely-tuned sound design. To reflect that Elena is a cellist, the music brings the cello to the forefront. It is at time soothing and soft, shifting into a low growl during solemn moments to finally break into jarring and sharp notes in moments of intense emotions. Needless to say, storytelling and metaphors is where Anamorphine truly shines. Unfortunately, not every aspect of this game is as polished as the storytelling experience. I found some levels to be confusing or unnecessarily long. Though I understood the narrative value in having me walk around the same rooms and corridors, there were instances where I had no real visual clues that I was advancing through the narrative. I either felt like I was getting lost or that the game was bugging out. Level design is a delicate thing: how many times can you walk in circle in a hospital corridor before the player loses track of the narrative and simply starts to feel frustrated? This game got it mostly right, but not always. Those instances broke my immersion and left me feeling frustrated and also nauseous. The web designer in me also had a fit when I first paused the game and saw the menu interface. I was greeted by what seemed like the default fonts and colours from Unity. I get that this game is a minimalistic experience and the menu isn’t a core part of gameplay, however, polishing every aspect of your game elevates it and makes it stand out from the lot. It’s easy to see that Anamorphine was made for VR. I’ve tried every VR headset out there, and they all made me nauseous. Therefore, I unfortunately cannot vouch for the full virtual experience and performance of this game. Playing Anamorphine on my computer with a good headset still made for a good immersive experience. I was able to appreciate the story, the visuals and the music. Still, Anamorphine made me wish I could play VR games as I feel it would’ve brought this game to a whole new level. Anamorphine is the kind of game that offers a short playthrough but stays with you after, much like Florence or Journey. The outcome may not be obvious but the journey the game takes you on is one to leave you wondering what is and what might have been. Despite its shortfalls, Anamorphine is a must play for those who enjoy immersive emotional experiences. DISCLAIMER: Anamorphine review code was provided by Artifact5. The opinions expressed in the article above have not be affected by, dictated or edited in any way by the provider. For more information please see Girls on Games’ Code of Journalistic Ethics.